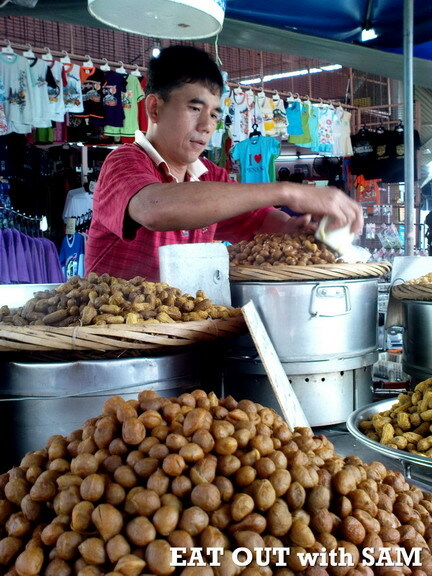 This Hawker will sell steam Groundnuts together with Maize, 'Kacang Kuda' (Chickpea) and 'Kacang Poi'. It has been existing there for more than 40 years and the trade has been passed down to his sons. The Cart is always stationed at the Junction of Penang Road and Chowrasta Road which is nearby to the Chowrasta Market. The steam Groundnuts, Maize, 'Kacang Kuda' (Chickpea) and 'Kacang Poi' are very popular with the locals as snack food. The snack food must be taken while it is still warm. When it is cold it will lose its taste. You will find that the steam Groundnuts, Maize, 'Kacang Kuda' (Chickpea) and 'Kacang Poi' from this hawker are always fresh. The taste of the steam Local Groundnut is more tasty than the Groundnut from China. Sometimes he has to use the China Groundnuts instead of the local groundnuts because there are great demand for it and also short of supply from local market. For your information, 'Kacang Poi' is a seasonal pea. Normally it is availalble in the middle and towards the end of the year (From August to November). Mostly the supply of 'Kacang Poi' comes from Thailand. In Hokkien, they call it 'Ang Moh Toh Tau'. I find that a lot of people (esq the local) does not know how to eat this. You have to peel the soft husk before you eat it. There are 2 types of 'Kacang Poi'. One with yellowish colour (Left Side) and the other one reddish in colour (Right Side). The reddish one tastes better than the other one. No. 11: View of 'Kacang Poi' aka Bambara Beans were orignated from Africa. Asam Laksa Johor Road, Penang.